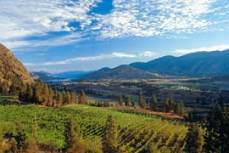 British Columbia's scenic Okanagan-Similkameen Valley is flanked by low-lying mountains and centred with glittering blue lakes. On a tour of the region's lush wine country, many vineyards welcome visitors to sample their wines. 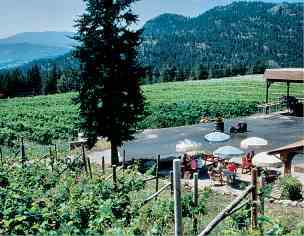 The Okanagan Similkameen Valley is B.C. 's largest wine appellation. This sunny region is a paradise of fresh local produce, wines, glittering lakes and outdoor activities. After years of visiting - to ski at Silver Star, Big White, Apex and Sun Peaks or to golf, this time I'm touring wineries. The chef at Fresco - my first restaurant stop in Kelowna - looks familiar. Aside from being named Provincial Restaurateur of the Year, taking home the Best B.C. Wine List award and earning a coveted four-diamond rating from AAA/CAA, Rod Butters sparks memories of the kitchen at the Wickaninnish Inn in Tofino on Vancouver Island, Chateau Whistler and two Toronto dining hotspots, Scaramouche and the Four Seasons Hotel. That he ended up in the Okanagan Valley in interior British Columbia was no accident. With some 60 producers and counting, the Okanagan/Similkameen Valley is B.C. 's largest wine appellation. My drive runs south from near Vernon, down Highway 97 to Osoyoos, which hugs the Washington border. The long scenic valley is flanked by low-lying mountains and centered with glittering blue lakes. First stop: Gray Monk. One of the valley's originals, it is owned by the Heiss family, whose vineyards date back 30 years. Willi Franz, chef at the Williams Inn in Kelowna, commands the kitchen at the winery's Grapevine Patio Grill, with its sweeping view of vineyards and Lake Okanagan. In summer, Gray Monk's deliciously fruity whites draw over 500 visitors a day to its tasting rooms. Off to Kelowna, the largest city in the central Okanagan Valley. With a population of under 100,000, it boasts more money per capita than any other Canadian city. The Grand Okanagan is smack in its heart by Lake Okanagan. Never mind that the big hotel teems with conference-goers and casino devotees, my French Country-themed suite has views of a spectacular sunset. Dinner at Fresco is a short walk away. So is Calona Vineyards, a large winery that delivers a great tour. The next morning I traverse the Okanagan Lake Bridge, the longest floating bridge in North America, and climb Mount Boucherie to the Mission Hill winery, an architectural masterpiece with archways leading to a 16th-century Austrian fountain, a terrace patio for dining, a loggia for relaxing and an outdoor amphitheater where Vancouver's acclaimed Shakespeare company Bard on the Beach performs will perform this summer. A 12-storey bell tower rings in the time. Underground, an education center offers daily two-hour wine programs. Best of all, the retail shop is a winophile's mecca, stocked with Mission Hill's 26 different wines, including value-priced Sauvignon Blanc and Pinot Gris. Later, midway to Oliver, I stop for lunch at the Cellar Door Bistro at the Sumac Ridge winery in Summerland. Chef Neil Schroeter's pork and tamarind curry perfectly matches Sumac's signature Private Reserve Gewurztraminer. For diners who like variety, Sumac offers a flight of four wines in two-ounce tasting portions. Upstairs, the Connoisseurs Room pairs high-end wines with canapés. The lakes shimmer and twinkle until past Penticton, where the land becomes a dry desert of sage and antelope bush, tumbleweed and prickly pear cactus. "Welcome to Desert Wine Country," announces the first sign, and shortly after, "Oliver - Wine Capital of Canada." The 15 or so wineries between here and the border may well qualify them to the title based on numbers. The desert is real too: called the Sonora, it runs from Mexico through the U.S. and up into Canada. Its heat and sunshine prime the Golden Mile, Black Sage and Osoyoos Lake areas for the best red wines in the country. I stop for the night at Tinhorn Creek, where I join a couple who are on the winery's Wine Lovers Club package. Lorne and Anne Vaness received the three-night, four-day package of tutored wine tastings, escorted trips to nearby wineries and vineyard tours as a gift. During a wine and food extravaganza, Chef Larry Lee cooks up delicious courses as club director Sonya Konig explains the intricacies of matching the dishes with wine. Next morning, the sky is overcast. Could this be rain in a land Environment Canada called our most desirable climate for living, with more than 2,000 hours of sunshine and less than 12 inches of rain a year? No. When the sun breaks through, I set out on the Stamp Mill Trail behind Tinhorn to work off the previous evening's indulgence. The hike rewards me with a view of the ruins of a mill and a panorama of the valley in buttercup season. Continuing south, I stop at Black Hills, a tiny winery under a rust-red Quonset hut where winemaker Senka Tennant makes two handcrafted wines, turning out fewer than 3,000 cases a year. Her red Bordeaux-style blend Nota Bene has cult status and sells out quickly. The pre-release sample of 2001 is so delicious I order a case. Many B.C. wineries offer door-to-door delivery. It beats schlepping wine around in a hot car. At nearby Burrowing Owl, the Wyse family are expanding their winery, evocative of the desert styles of New Mexico and Morocco. (For diversion, they golf at nearby Fairview - rated among B.C. 's top 10 courses - or ski in the springtime Slush Cup event at Mt. Baldy. Oh to have those choices!) Lunch on their patio comes with a lovely view, but Burrowing Owl's fabulous red wines grab my attention. On a wine tour of the Okanagan/ Similkameen Valley, oenophiles imbibe stunning scenery as well as delicious wines. Temptations to stop for photos are plenty. This shot brings memories of a lush vineyard near Okanagan Falls. My most southerly stop is the Nk'Mip Desert Centre and its winery overlooking Osoyoos Lake. North America's first Aboriginal-owned and operated winery has 240 acres of vineyards, first planted in 1968. Numbering about 400, the progressive Osoyoos Indian Band (Nk'Mip in the Okanagan language) also runs lakeside camping facilities and a heritage center, in addition to serving lunches that include buffalo carpaccio, quail terrine and Indian salmon. Hiking their well-designed trails, I learn from the interpretive signs about desert plants and animals. Aspects of Okanagan Nation desert life are portrayed in the recreated tulle mat teepee, underground pit houses and sweat hut. The next day I return to the Penticton area, to the wineries around Naramata on the southeastern tip of Lake Okanagan. Naramata is a charming village with 11 wineries, including some of the best of my trip. I order the Pinot Gris for home delivery from among the brilliant wines at Poplar Grove and buy some Tiger Blue, one of three artisan cheeses made there. At La Frenz, winemaker Jeff Martin sells some of his most cherished wines exclusively at the cellar door. I overnight at Coady's Cabana, one of the B& B's dotting the countryside. My "mini house," built by architect/owner Matthew Coady, has floor-to-ceiling windows, a fireplace, Jacuzzi, outdoor patio and retractable roof for open-air sleeping. Another good choice is the restored Naramata Heritage Inn & Spa, where Chef Robert McLaren serves up tasty food in the cozy wine cellar and formal dining room, accompanied by an extensive list of B.C. wines. The final day I hike along the Kettle Valley Trail, part of the Trans Canada Trail network, through the vineyards of the King Family Farm towards the Hillside winery. With a patio overlooking the lake, Hillside's Barrel Room Bistro is a great food destination. The trail runs for about 62 miles from Penticton, right past the Bistro, to McCulloch Lake. The British Columbia Wine Information Centre in is my last stop. Just in case I've missed something good, they sell over 400 wines from about 40 of the local wineries. Upon my return to Toronto, I think with envy of Rod Butters' new home. For more information on this destination visit the Canadian Tourism Commission web site at https://caen-keepexploring.canada.travel/.